This visit allows visitors to discover the tropical flora of Salazie and try their hand at traditional fishing. 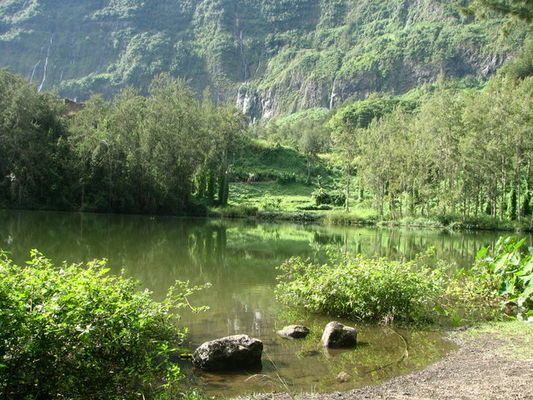 Hidden behind a lush green enclosure, the Mare à Poule d'Eau site turns out to be one of the most beautiful stretches of water in La Réunion. On its banks, the Chayotte squash - the king of the Cirque, does not have the monopoly. Taro plants, watercress, bamboo and other plants make up this plant kingdom. As far as the animal kingdom is concerned, the observant visitors can observe the habits of the moorhen, the life of freshwater fish and the role played by aquatic insects. Guided visit scheduled every Tuesday with a local guide ("guide péi") for at least 4 people. Please call Dominick for other days.